There are some ways to locate living relatives that you may not be aware of yet. 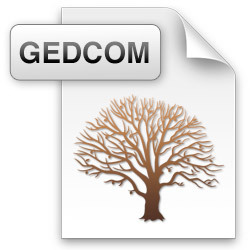 If you have used Rootsweb with the GEDCOM database of submitted family lines, this could also help you contact with other living family members -say a 2nd cousin. With over 6,421,865 surnames and databases numbering 446,203, there is a good chance you might find a relative. Place a known ancestor, say a grandfather or great grandfather. Place as much overall information with a spread of years for birth-marriage-death or locations. The other person who might have that same ancestor may have different dates than you. Once you do the search, a long list of possible databases may appear or just a few. If no databases appear, revise your submitted information on an ancestor, such as the place of birth or death. Under the top column labeled ‘Database‘ will be the person who submitted that ancestor usually with a code series of number or initials, etc rather than the person’s full name. Once you click on that ancestor to see the details, at the top will be the person’s full name and their email, who submitted it. Keep in mind some of the submissions could go back 15 plus years and email addresses change. Check the other listings and see if that person submitted a more up-to-date or recent database. Besides the email address of a possible living relative, some also have a web site covering that family. Look for a ‘Homepage’ on the Rootsweb which could have a web site with more details. If you need to revise your search, there is a search box below the list of any names and their databases. Try searching just a surname without the given names, because the names could have been done only as initials. Another good method also using Rootsweb is with the Message Boards. Go down to the 3rd list of topics labeled ‘Surnames’ with letters A-Z. Click on the right letter for the surname you are looking for. Keep narrowing down the spelling – again just the surname. Then scroll down the listing of surnames with the beginning 3 letters. There are ten posted on a page, go to the next page to search additional. You can also use the search box above for keywords. Type in the surname you are looking for that way also, especially if the spelling of the surname did not change over the years. Then click the button for surnames, then ‘Search’ and see what comes up. Now if that surname is a name for a city or county, that will appear also. Whichever method when searching the surname, there should be quite a few listings to review. Yes, many will not have any tie-in, but there could be just one which could provide a treasure chest of information and find a living relative. Remember to look for siblings of the ancestor you are searching, so have that list of other given names as you review the messages. Attempt to locate any living relatives, their research could prove to be a good step forward in knowing your family branch better. Photos: Rootsweb, GenCom; Message Boards.